It’s the weekend and the holiday season is in full swing! For many that means having a few drinks and while we may think we are unique in the animal world for liking to consume alcoholic products, sometimes overindulging and getting ourselves intoxicated, there are many other species that do the same thing. Sometimes on purpose, sometimes by accident! 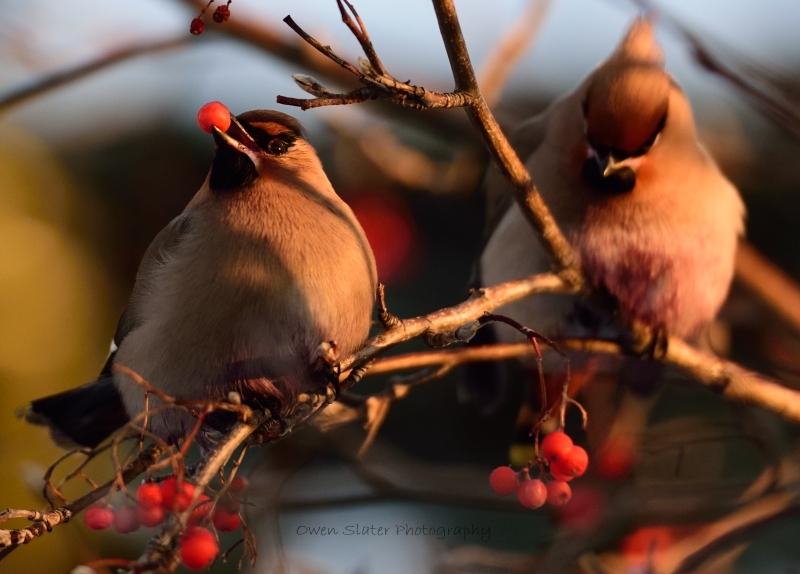 Take these Bohemian waxwings for example. Recently we treated several of these birds that came into the wildlife hospital with various injuries related to trauma. 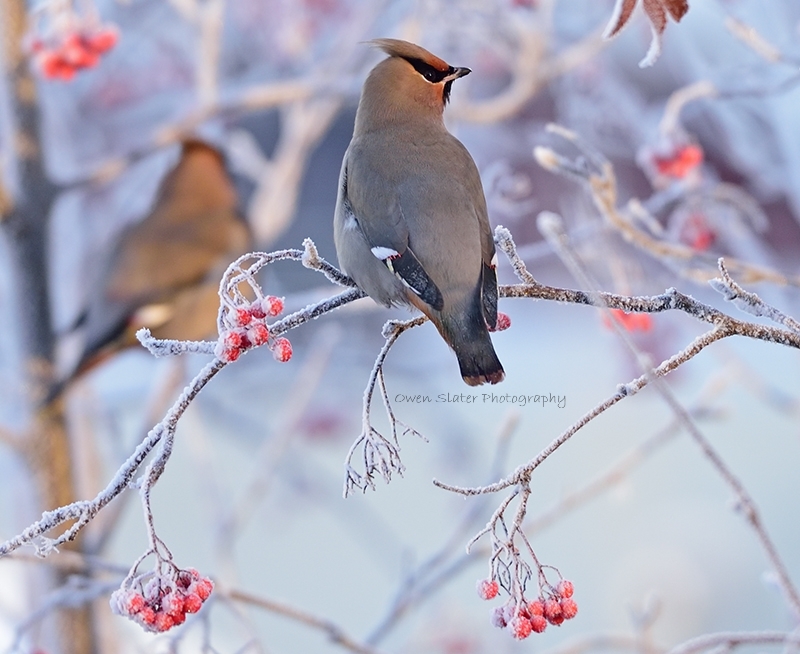 In early winter and spring it is common to come across large numbers of these birds on the ground, unable to fly and appearing drunk. They are in fact drunk! 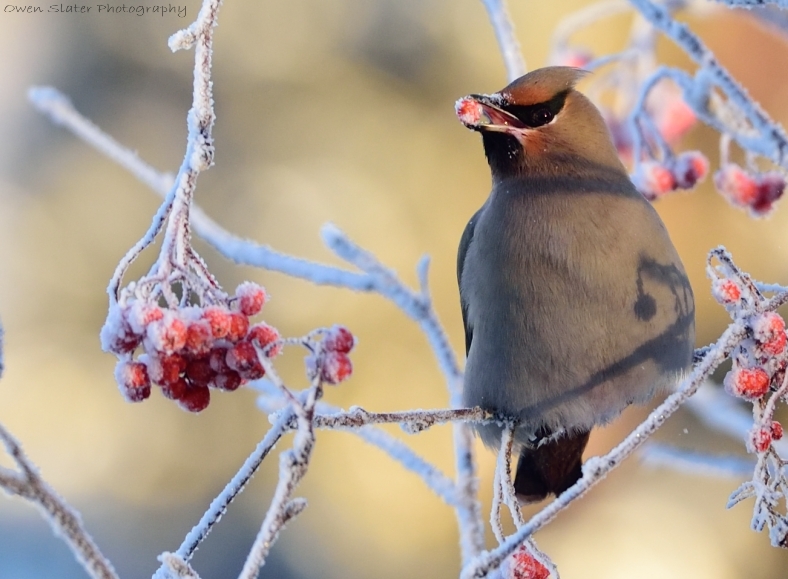 Many berries ferment on trees and in Alberta a good example is mountain ash, a favourite of bohemian waxwings. If they don’t overindulged they are usually fine, but if they get a little carried away, they consume enough alcohol that they start falling out of trees! Some get picked off my cats and other predators, some recover soon enough to fly away and some try to fly but end up hitting windows, cars, buildings, etc. That’s the most likely reason why we had a handful come into us earlier this fall. We put them through our recovery program, which consisted of fluids, pain killers, rest, and a diet of non-fermented berries. They quickly sobered up and after several days, any lingering sore muscles, aches and pains were gone and they were ready to rejoin their flocks. Not too different from many people during the holiday season I would say! 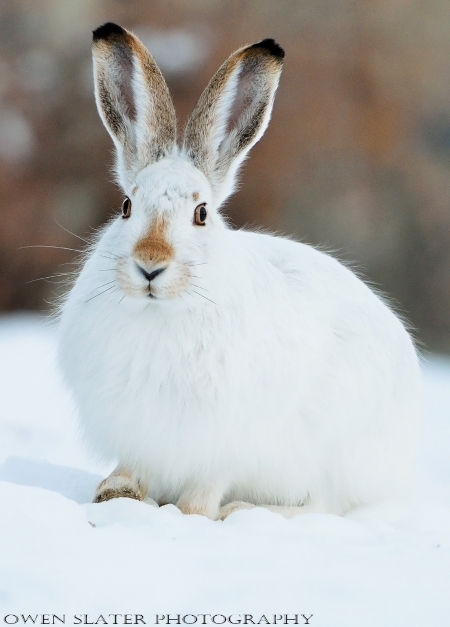 Prairie hares, also known as white-tailed jackrabbits are frequent backyard visitors in Calgary neighbourhoods but since they are primarily nocturnal, getting decent photographs of them is not easy. Sometimes a bit of luck is all that is required! This photo is probably the easiest wildlife photograph I have ever taken. I didn’t even have to leave the house! I just grabbed my camera, opened the sliding door and snapped off a few photos before the last of the sunlight disappeared. On one of the recent cold snaps in Calgary, a light dusting of snow covered the branches of the aspen trees in my backyard, creating a beautiful winter wonderland. I’m sure in a few months I will be longing for a tropical retreat, but for now I’m enjoying winter! 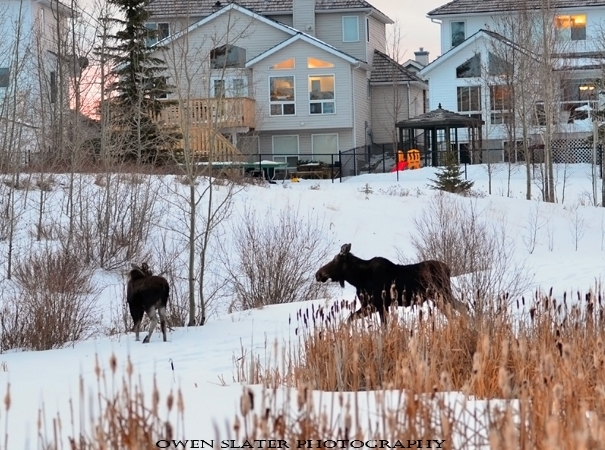 I often drive several hundred kilometers and spend countless hours outside trying to find wildlife to photograph. However, sometimes it’s much easier. This past week I just had to look out my office window! 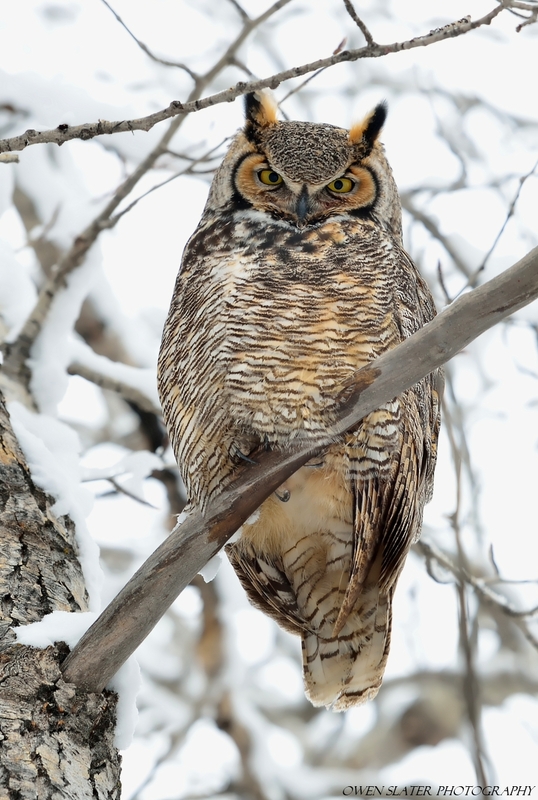 Sitting in a stand of aspen trees was this great horned owl. Not surprisingly the usual four squirrels that frequent the backyard were nowhere to be seen. I quickly grabbed my camera, took a few photographs and returned to the warmth of my office to watch the owl from a distance.